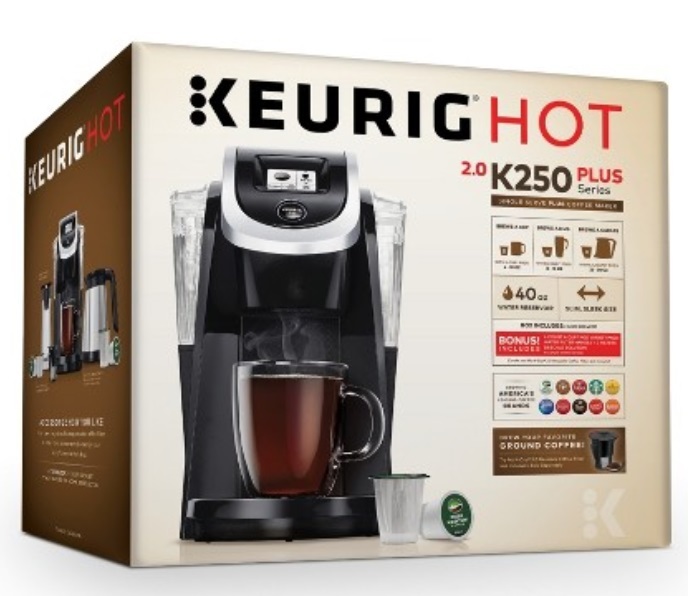 Target Cyber Monday Sale – 15% Off Sitewide! 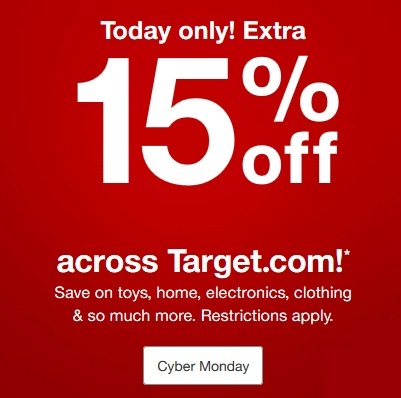 Target is offering 15% off sitewide today as their Cyber Monday Sale! Offer excludes adult care, alcohol, allergy medicine, Almay cosmetics, Apple products, baby diapers, baby feeding and baby care, Barbie Dreamhouse, Bose, beauty stocking stuffers, clinic & pharmacy, cosmetic accessories, Cover Girl cosmetics, cotton, dairy milk, deodorant, digestive health, DockATot, DSLR cameras & lenses, ELF cosmetics, Elf on the Shelf, eyecare, first aid, food and beverage, Fitbit, gift cards, Fisher-Price Imaginext Jurassic World Jurassic Rex, Google Home/Mini/Max, GoPro, HALO, hair care, Hot Wheels Corkscrew Crash, household essentials, JBL, LEGO, LG OLED TV, L.O.L. Surprise House, L’Oreal cosmetics, Maybelline cosmetics, mobile contracts, nail care, Neutrogena cosmetics, Nintendo hardware, NYX cosmetics, oral care, Owlet, pain relief, select Peg Perego, pet accessories, pet food, treats & rawhide, pet grooming items, cat litter, Philips Avent, power dental, power shave, prepaid cards, PS4 hardware, Red Dead Redemption ll video games, Revlon cosmetics, Rimmel cosmetics, Samsung TVs, smokers cessation, soap, Sonos, specialty milk, sun care, Switch games, Target Optical, Thomas & Friends Super Station Trackset, Tile, Traeger, trial & travel size items, Tylenol pain relief, Vitamix, Weber, wet shave, Xbox One hardware and items sold & shipped by Target Storefront Partners. 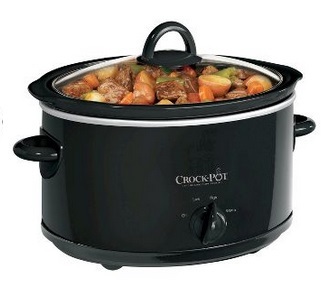 Discount not applicable to gift wrap, tax, or shipping charges. Target – Select Black Friday Deals Live For RedCard Holders!! Target has released their Black Friday ad, and a few of them are available today only at the Black Friday Prices! Target: K’NEX Revolution Ferris Wheel Only $7.48 (70% Off)!! 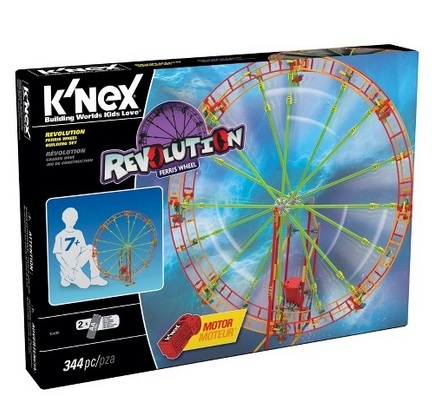 Target has the K’NEX Revolution Ferris Wheel marked down to only $7.48 (70% off)!! This building set features a battery-powered motor that spins the ride in either direction using authentic, rail-driven rotation, just like a real Ferris Wheel! 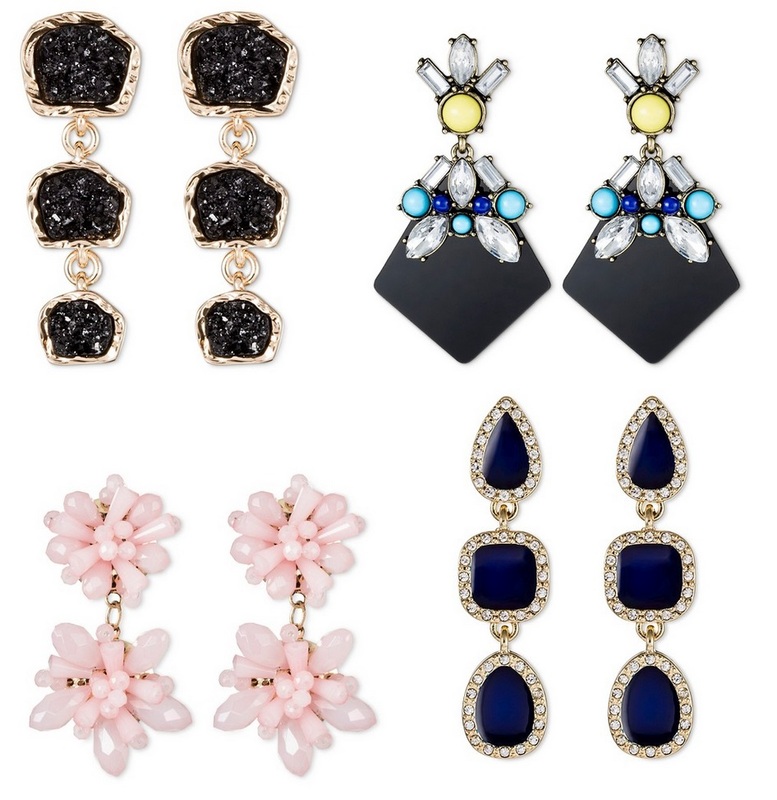 Get Free shipping on orders of $35 or more, or use your Target RedCard to save an additional 5% off get Free shipping! 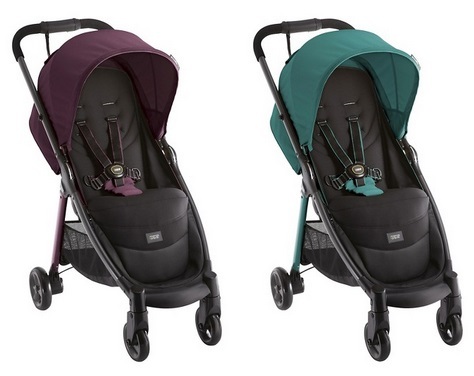 Mamas & Papas Armadillo City Stroller Only $102.58 – $134.98 + Free Shipping! Target has the Mamas & Papas Armadillo City Stroller on clearance for just $134.98 + Free shipping! 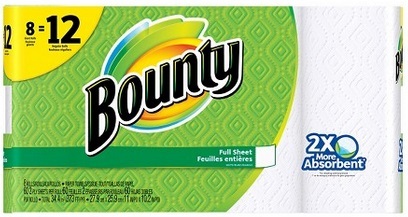 Plus if you use a Target RedCard to checkout the price will drop to just $102.58 + Free shipping! 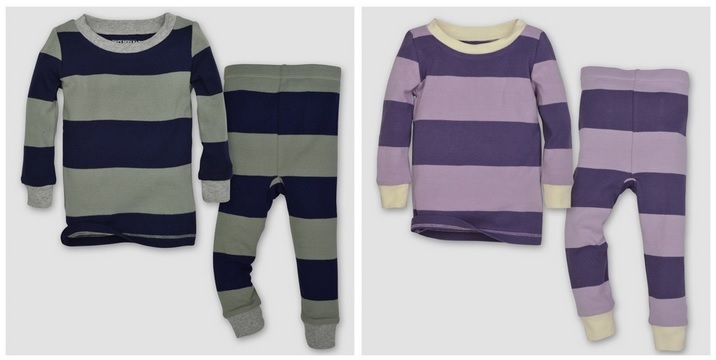 Burt’s Bees Baby Organic Stripe Pajama Sets Only $8.47 + Free Shipping! Target has the Burt’s Bees Baby Organic Stripe Pajama Sets (in baby and toddler sizes) marked down to only $8.47 + Free shipping! 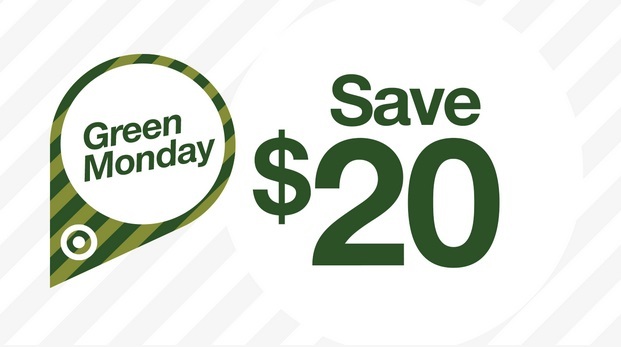 Target: Save $20 Off Every $100 You Spend! Offer excludes toys, select sporting goods, all gift cards, Target Restock orders, Target Optical, CVS pharmacy, Clinic, Vitamix, Weber, Traeger, prepaid cards (airtime, entertainment, iTunes, and online gaming), Elf on the Shelf, DSLR cameras and lenses, Google products, Bose, Sonos, JBL, TOM’s Apple Watch Bands, GoPro, Nintendo Hardware, Switch Software, Fitbit, Samsung and LG TV’s, Xbox Hardware, PS4 Hardware, PSVR, Tile, Target Mobile Purchases, alcohol, dairy milk, Power Dental, Power Shave, Tylenol and Apple items. Target is offering Free shipping on all orders on all orders through 12/23/17 (you usually need a $35 order to receive free shipping, if you are not a RedCard holder). 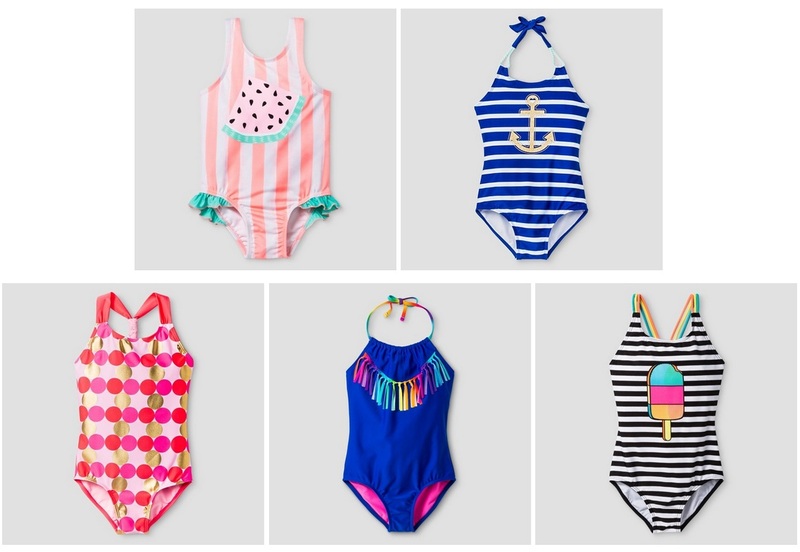 Target is offering 20% off these girls swimsuits with coupon code: MEMDAY added to your cart! • Toddler Girls’ Stripe Watermelon One Piece Swimsuit – Priced at $11.99, and only $9.59 after thew above coupon code. • Girls’ Tankini Sets Navy – Priced at $16.99, and only $13.59 after thew above coupon code. • Girls’ Foil Dot 1-Piece Swimsuit – Priced at $16.99, and only $13.59 after thew above coupon code. • Girls’ One Piece Swimsuit With Tassels Xhilaration – Priced at $14.99, and only $11.99 after thew above coupon code. • Girls’ One Piece Swimsuit Popsicle Stripe – Priced at $14.99, and only $11.99 after thew above coupon code. 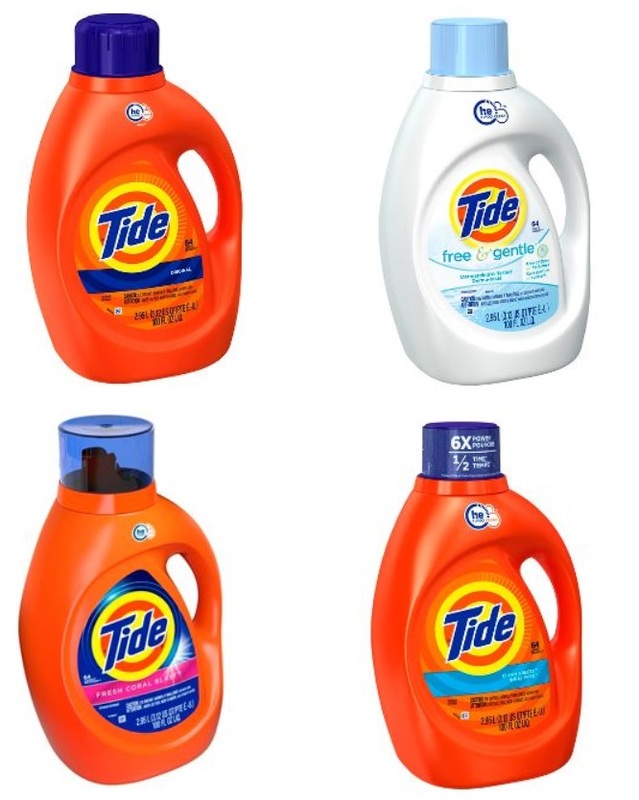 Target: Toddler T-Shirts (Boys Or Girls) Only $4 – $5 Each! 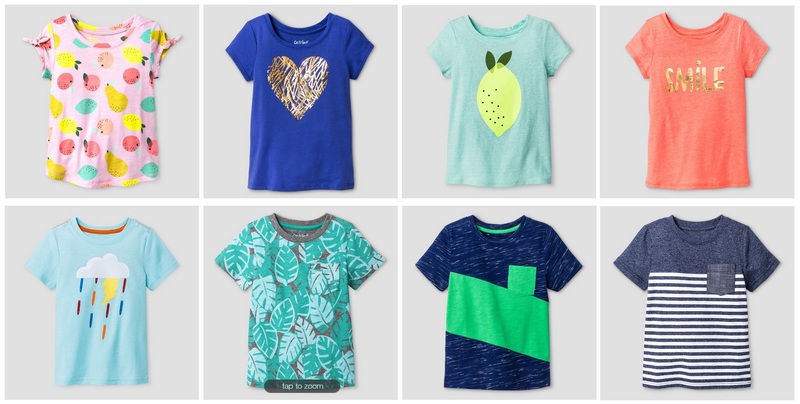 Target has select toddler t-shirts (boys and girls) for just $4 – $5 each! 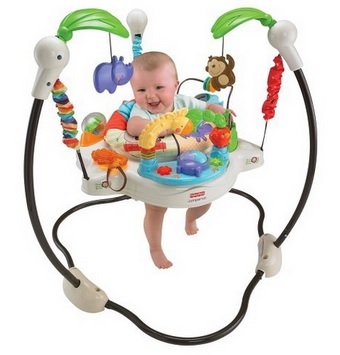 Evenflo ExerSaucer Bounce & Learn Activity Center Only $33.49 + Free Shipping! 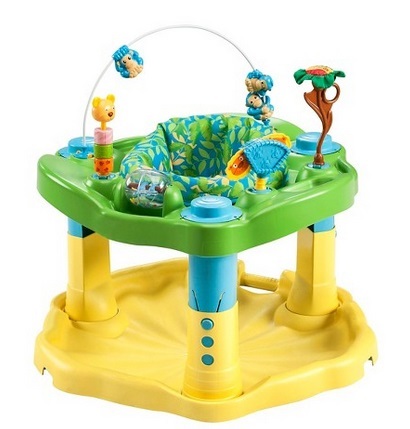 Target has the Evenflo ExerSaucer Bounce & Learn Activity Center on sale for $33.49 + Free shipping! 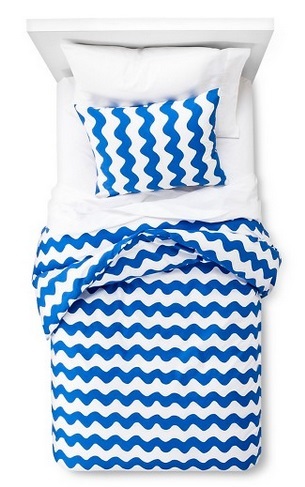 Target: Zig Zag Duvet Cover Set – Blue (For Twin Size Beds) Only $17.48 (reg. $49.99)! 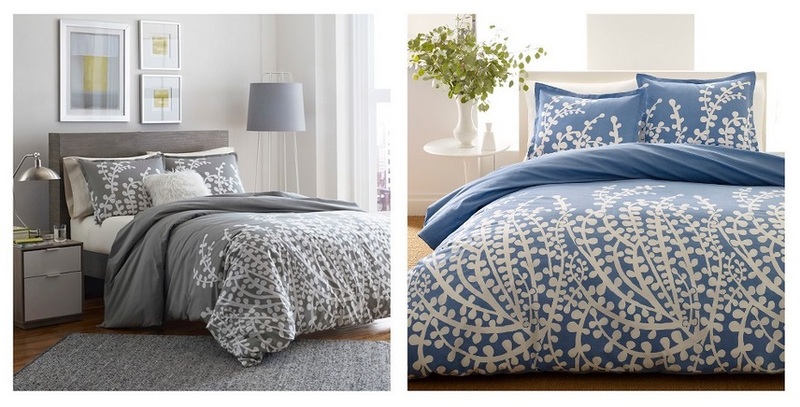 Target has the Zig Zag Duvet Cover Set in blue for twin size beds (includes 1 duvet cover, and 1 pillow case) marked down as clearance to just $17.48 (reg. $49.99)! Back in stock, but going to sell out fast! 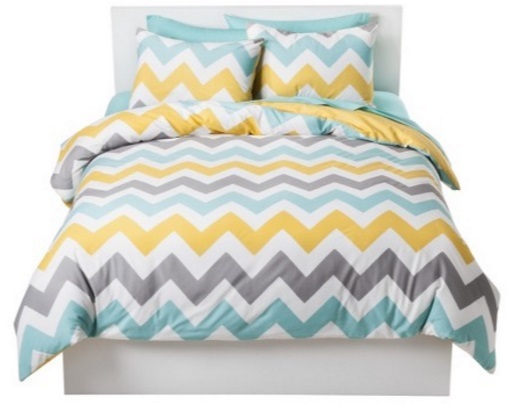 Target has the Chevron Duvet Cover Set Multicolored – Room Essentials (for twin size beds) marked down to only $13.99! 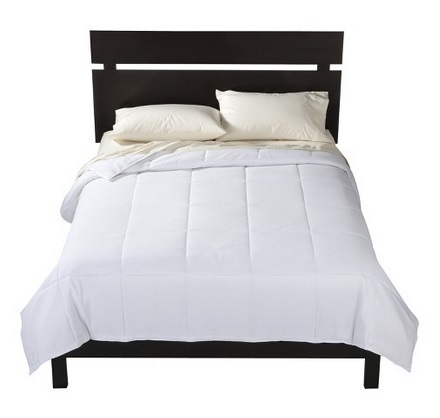 This set includes one duvet cover and one pillow case. 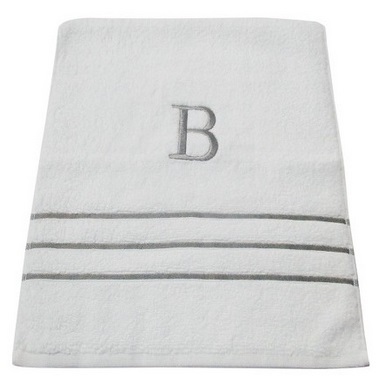 If you like you can purchase an this as an extra Chevron Sham (pillow case) for just $6.99! 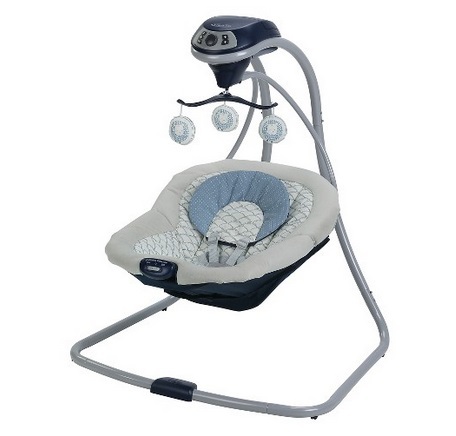 Graco Glider Lite Gliding Swing Only $48.63 + Free Shipping! 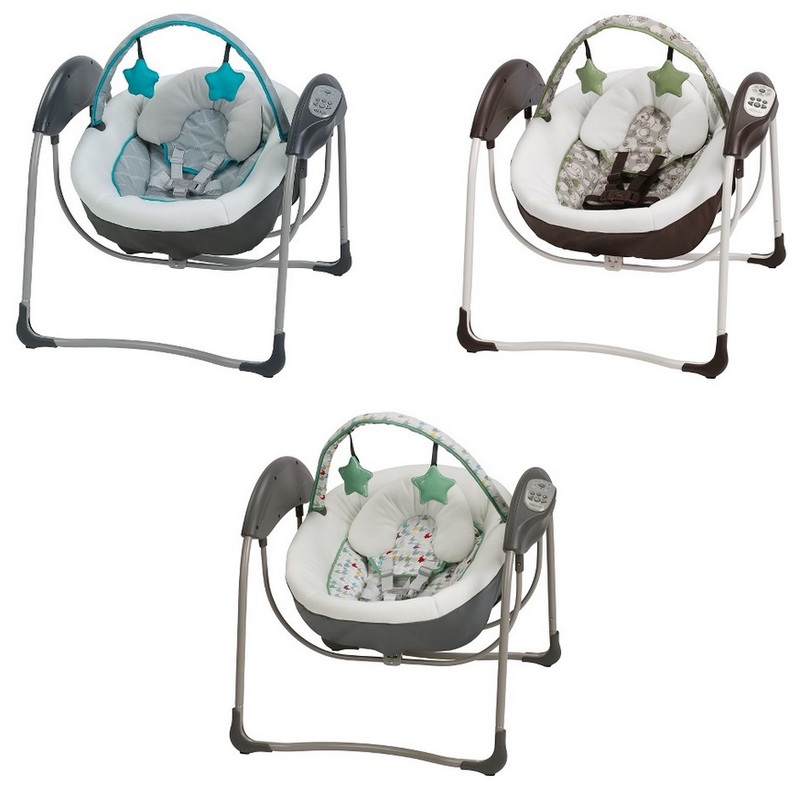 Target has the Graco Glider Lite Gliding Swing (available in 5 colors), marked down to only $51.19. 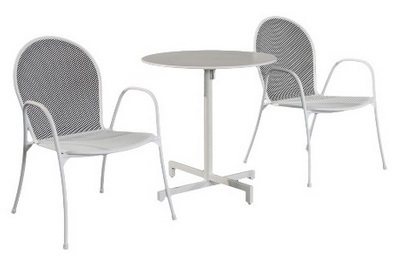 Plus add coupon code: GRACO to save an additional 5% off and bring the price down to only $48.63 + Free shipping! 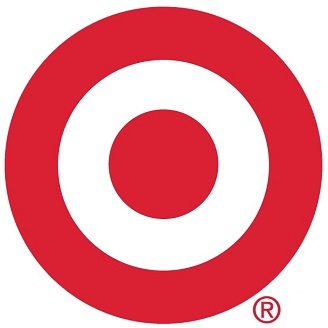 Use your Target RedCard to save an additional 5% off get Free shipping! Target has the Toddler Girls Veola Velcro A Line Gold Canvas Sneakers marked down to only $12.74. 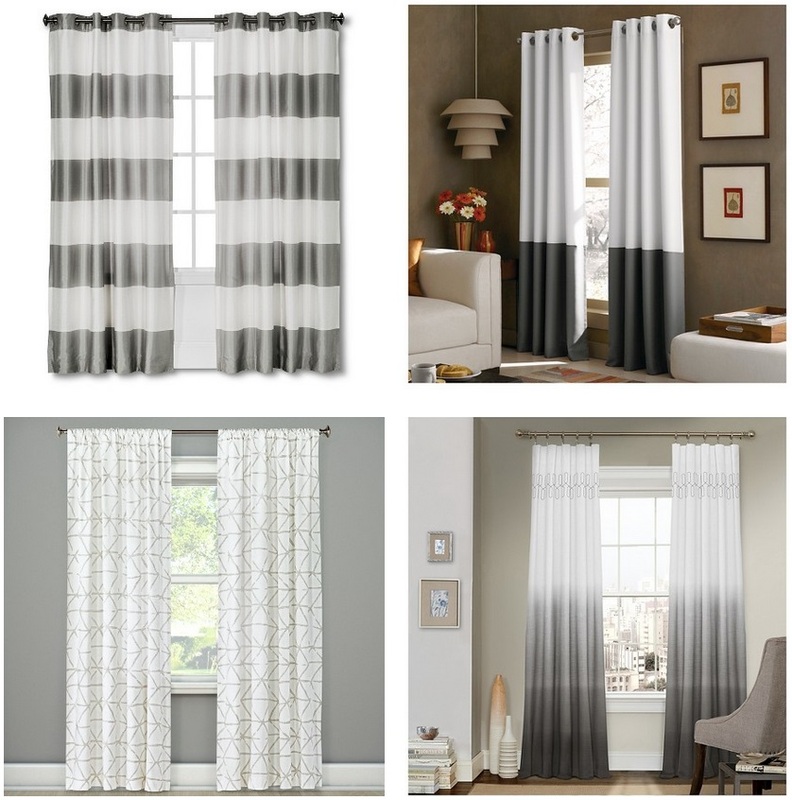 Target has some nice window curtains marked down 30% through tonight. 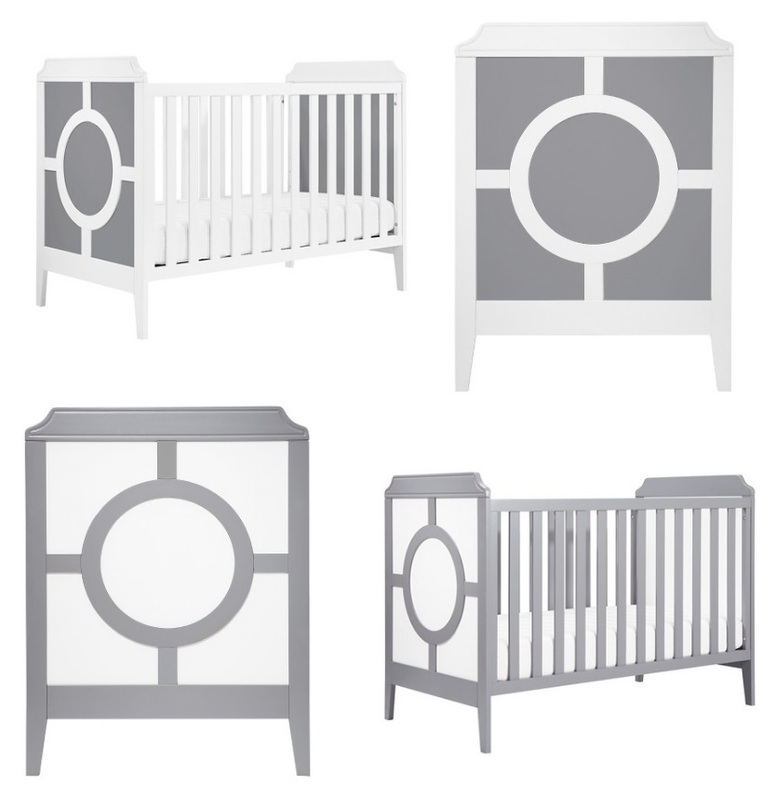 Target has the DaVinci Poppy Regency 3-in-1 Convertible Crib for $199.99, plus add the Bedtime Originals Choo Choo Plush Elephant to bring your total over $200, and in your cart you will automatically save $40, making your total just $166.58 + Free shipping.